Mary Curzon (1870-1906), wearing the Peacock Dress. Oil painting by William Logsdail, 1909. Lady Curzon’s Peacock Dress is an elaborately embroidered garment dating from the early twentieth century. It was worn by Lady Mary Curzon (1870-1906) at the Coronation Ball of the Delhi durbar of 1903. The dress is currently kept at Kedleston Hall (Derbyshire, England), the ancestral home of the Curzon family (National Trust Inventory Number 107881). Lady Curzon was born Mary Victoria Leiter, in Chicago (USA) in 1870, the daughter of Levi Ziegler Leiter, co-founder of the Chicago department store Field and Leiter (which later became known as Marshall Field). In 1895 she married George Nathaniel Curzon, 1st Marquess Curzon of Kedleston (1859-1925). 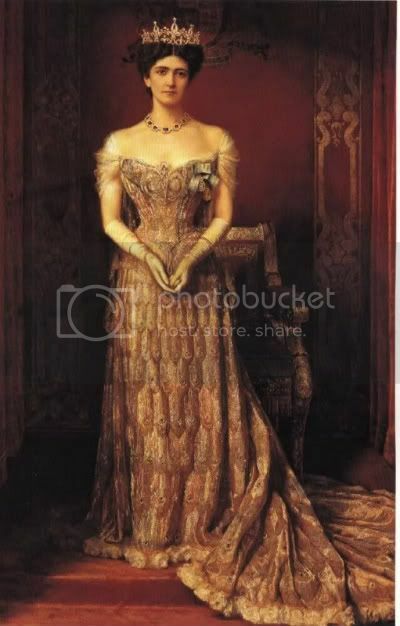 In 1898 George Curzon was appointed as Viceroy of India and Lady Curzon became the Vicereine. In order to celebrate the coronation of King Edward VII in 1902 a grand ceremony or durbar was organised in Delhi, India. The finale of the durbar was the grand Coronation Ball held in the Hall of Private Audience (Diwan-i-Khas) in the Mughal Red Fort, Delhi. It took place on 6th January 1903. The dress worn by Lady Curzon at the durbar became known as the Peacock Dress. It was made in two parts, namely a bodice and a separate skirt section. The bodice includes embroidered net and applied gold and silver jewels (produced by the House of Worth, Paris). The neckline was accentuated with a lace panel and embellished with rhinestones, spangles, etc. The skirt was made from several layers of cloth, which have been described in various ways. The ground material, for example, is sometimes described as cloth of gold, but this is inaccurate as cloth of gold is technically a woven cloth. It has also been suggested that the ground material is a silk chiffon. However, Cathy Hay, who has made a detailed study of the dress, writes that the ground consists of a champagne coloured silk taffeta with a lining of a densely woven Indian cotton muslin. The skirt is covered in representations of peacock feathers worked in various forms of metal thread (zari work), The centre of each feather is further embellished with an iridescent beetle elytra (wing casing; cetonia cyrata), not with an emerald as is sometimes suggested. The embroidery of the skirt section was carried out in India by professional gold thread embroiderers. Use was made of two types of metal thread, namely passing with a white core (passing thread), and crinkly purl. The dress weighs over 4.5 kg as a result of all the metal thread. When they were completed the various skirt panels were sent to the House of Worth, Paris (France), to be made up into the gown. It was at this point that the bodice was embroidered and the jewels and lace were added. In addition, the hem of the garment was accentuated with c. 100 white silk roses (the original roses were replaced in the 1950's). When Worth’s were finished with the dress the product was sent back to India for the durbar. JOHNSON, Donald Clay (2012). 'Queen Alexandra’s 1902 coronation gown,' Textile Society of America Symposium Proceedings. Paper 700, pp. 1-5. Digital source of illustration (retrieved 26th June 2016).